Carbon, held in frozen permafrost soils for tens of thousands of years, is being released as Arctic regions of the Earth warm and is further fueling global climate change, according to a Florida State University researcher. Assistant Professor of Oceanography Robert Spencer writes in Geophysical Research Letters that single-cell organisms called microbes are rapidly devouring the ancient carbon being released from thawing permafrost soil and ultimately releasing it back into the atmosphere as carbon dioxide. Increased carbon dioxide levels, of course, cause the Earth to warm and accelerate thawing. "When you have a huge frozen store of carbon and it's thawing, we have some big questions," said Robert Spencer, assistant professor of oceanography. "The primary question is when it thaws, what happens to it? Our research shows this ancient carbon is rapidly utilized by microbes and transferred to the atmosphere, leading to further warming in the region and therefore more thawing. So we get into a runaway effect." Spencer and a team of researchers first began looking at this issue of what happened to the carbon as permafrost thawed several years ago. There was a gap in the scientific literature because terrestrial scientists had found that permafrost was thawing and thus releasing long-stored carbon. But, aquatic scientists found no evidence of that ancient carbon at the mouths of major rivers leading to the Arctic Ocean. So, where did the carbon go? The simple answer is that it became food. The more complex answer provides an interesting glimpse into how some of the smallest living organisms can have a major effect on the planet. Microbes, single-cell organisms that are too small for the human eye to see, are the oldest form of life on Earth and carbon is a rich food source for them. Scientists weren't finding carbon at the mouth of major Arctic rivers because it was already consumed and released into the atmosphere. "This material is very attractive to these microbes as a food source," Spencer said. "As permafrost thaws, microbes are going to use this carbon with clear ramifications for climate change." To conduct this study, Spencer led a team of researchers who spent more than three months between 2012 and 2014 studying thawing permafrost in Siberia. Permafrost in the region is extremely deep—more than 100 feet in some places—and has remained frozen for tens of thousands of years. At 19 different sites in the Siberia region, Spencer and his colleagues collected hundreds of water samples and conducted experiments to determine what portion of the carbon pool microbes were using as a food source—the ancient carbon coming from the thawed permafrost or new sources. Spencer acknowledged it is exceptionally difficult for scientists to capture that process in real time, but future research will take his team to small streams dominated by permafrost thaw to see if they could quantify permafrost carbon inputs before microbes gobble it up. "We have to capture this material as soon as it thaws because that's where we see its unique compositional features which make it so attractive to microbes," he said. As a general rule, if Freeman Dyson doesn't understand something, you don't, either. A little humility would serve you very well in life. Please stop this silly worship of Freeman Dyson. It invalidates everything else you say. 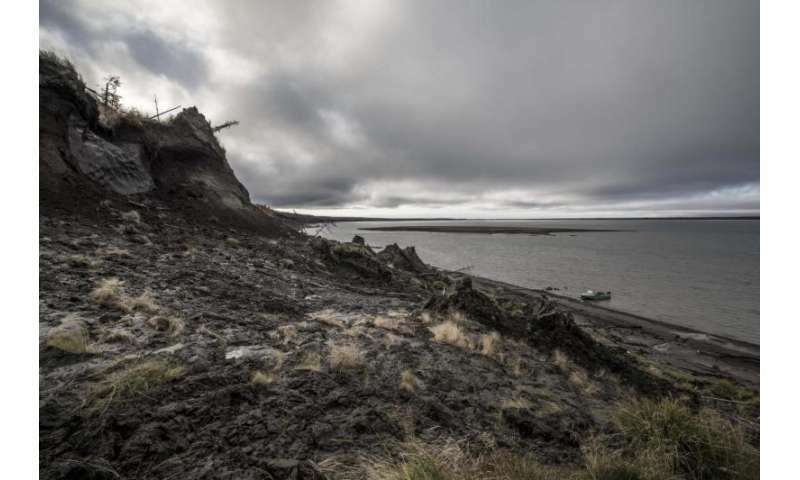 So if there's no global warming, why is the 50,000 year old permafrost melting? Why did miles-thick glaciers covering North America suddenly melt? You didn't answer the question- and the glacial-to-interglacial melting happened 11,000 years ago. The permafrost didn't melt then. It's older than that. You've got a little problem explaining that, looks like. As far as why the transition happened, it's due to the Milanković cycles, which are variations in the Earth's axial tilt and orbit. But there are no such variations happening now. Only CO₂ buildup. Worth mentioning that the next transition, from the current interglacial to the next glaciation of the current ice age, is predicted in about 50,000 years from today.
" . . . . the next transition, from the current interglacial to the next glaciation of the current ice age, is predicted in about 50,000 years from today." I set the kitchen timer. Gracie, now you're just harassing. Typical 16 year old girl with Internet Disease. We never even came close to achieving the climate action targets science said we needed to save the planet 25 years ago. 34 MORE years of climate "ACTION" failure and global disbelief is 100% certain now and proves science's 97%certainty was not "certainty", just a consensus of vague science? Be happy, like a real progressive would be. Yes, nonoUNme, and almost entirely due to the tireless efforts of your handlers. The fact that you are entirely unaware of your ideological manipulation in no way absolves you of the share of blame with which you have thereby obligated yourself. I just hope that you are using your troll-dollars to eat only the best of victuals, since it's likely only a matter of time before trollpork is the only form of sustenance left to the remainder of H. sapiens subsequent to the coming GOD(GlobalOmnicollapsiveDisaster). Behold, the Dawning of the Age of Aquarius! Geez, did he actually use the fact that the deniers obstructed any action on climate change to try and deny climate change? Wow, unbelievable. Logical fallacy: affirming the consequent. Umm, if you are referring to me as "nonoUNme", as you have before, whatever childishness that is supposed to mean,... I have not posted in this thread. Din't know that. Maybe Caliban thinks mememine is your sockpuppet. My apologies, Noumenon, for misapplying the nick. It was directed at memememememe. Thanks for noticing the error and bringing it to my attention. Ok, but why did you troll-rate me 1's in This Thread ? Ok, but why did you troll-rate me 1's in http://phys.org/n...cal.html ? For the same reasons as (nearly) always. Do you suppose that my being in near-polar, perpetual disagreement with your views somehow makes me incapable of acknowledging a mistake?